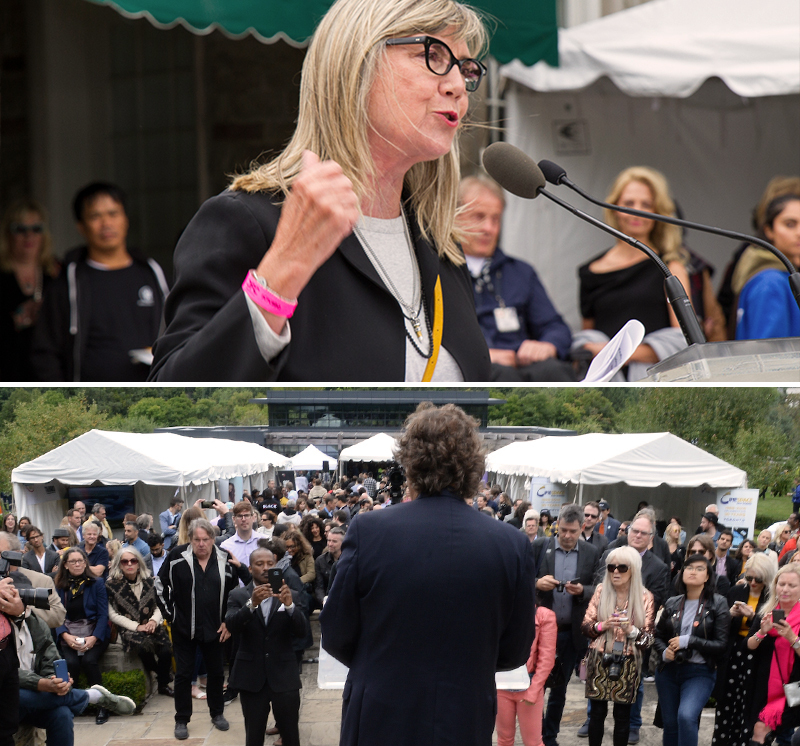 Chilly winds and grey skies did not deter the more than 2,000 guests from attending this year’s CFC Annual BBQ Fundraiser on Sunday, September 9CFC’s heritage grounds of Windfields Estate. This year’s gathering, one of our largest and most well-attended fundraisers ever, also marked the CFC’s 30th anniversary. 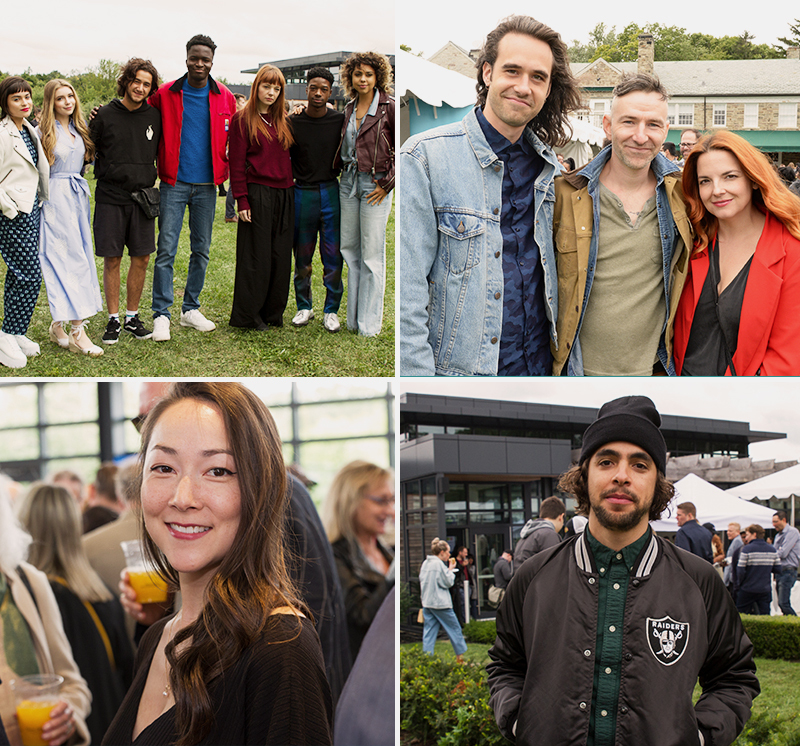 The CFC Annual BBQ Fundraiser contributes to our charitable work of accelerating the content, careers and companies of Canadian creative and entrepreneurial talent in the screen-based and digital industries. It is also a key festival destination and popular networking event. Held annually during TIFF’s opening weekend, the CFC BBQ has grown in scale, much like the festival itself. Our emcee for the afternoon was Christina Jennings, Chair, CFC Board of Directors, and Chair & CEO, Shaftesbury, with host Slawko Klymkiw, CEO, CFC, and CFC Founder and Chair Emeritus, Norman Jewison (who attended with Lynne St. David Jewison) also speaking. The CFC Annual BBQ Fundraiser also offers us an opportunity to applaud our many talented CFC alumni and supporters with projects in TIFF – a direct result of the talent coming out of our programs. Mid-afternoon, Christina Jennings took to the stage to thank our sponsors (see the full list below!) for helping us celebrate “30 years of shaping Canada’s entertainment landscape.” She also made the first of our two major announcements, sharing the creation of the Jay Switzer Comweb/William F. White Indigenous Creator Scholarship to be administered through the CFC in memory of this visionary leader. “Through this award,” Jennings noted, “he will live on in our industry. Taking the stage to complete the day's remarks, our Founder and CEO, Norman Jewison, offer his reflections on the CFC’s history and future. He began by bringing onstage and paying tribute to the honourable former mayor of North York and Toronto, Mel Lastman, for agreeing to provide the CFC with Windfields Estate. Lastman was, in Jewison’s words, “the man who really made it happen.” Looking to the future, Jewison noted that both the CFC and wider industry are once more on the cusp of change; Thanks to this new Netflix-CFC Partnership, Jewison stated that we are “moving with the industry” and building new generations of Canadian talent to be proud of. Our CFC alumni are now working all over the world, he said, “producing wonderful stories that are putting this country on the screens of the world. There was no shortage of delectable refreshments or entertainment throughout the day. 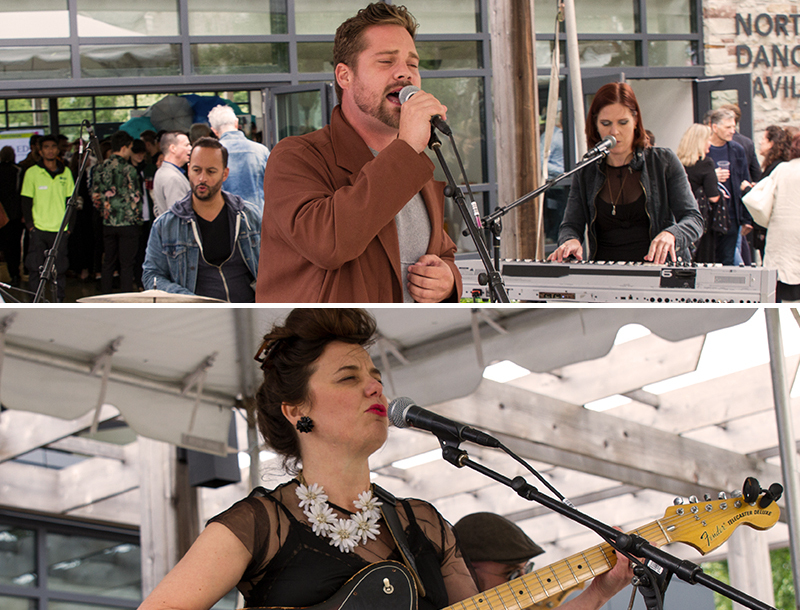 After the speeches, we were treated to two riveting musical performers: Rebecca Everett, alumna of the Slaight Family Music Lab, followed by Theo Tams, who performed courtesy of Slaight Music. Also, as part of the event’s fundraising activities, we held a raffle for one lucky winner of a two-night stay at the unique Anndore House in Toronto, with dinner for two at Constantine Restaurant and a $250 gift card donated by Anzie Jewelry. 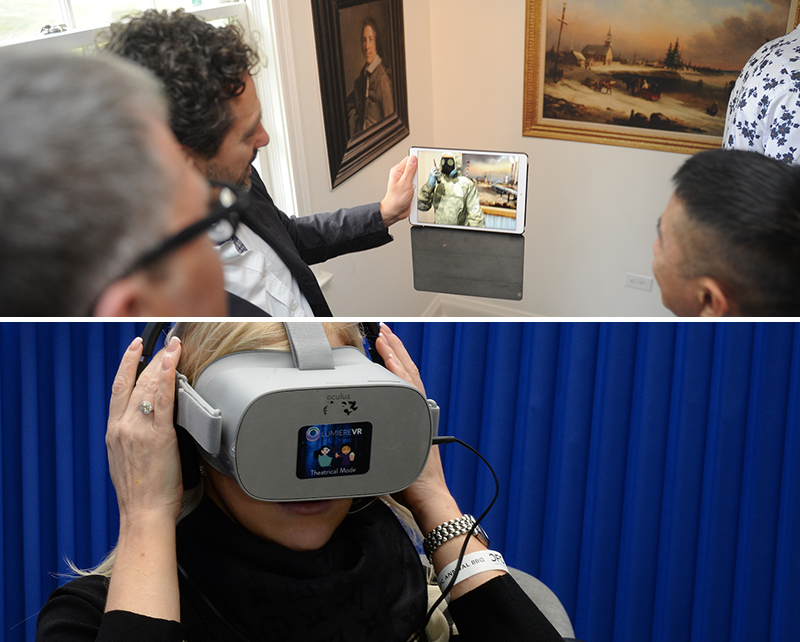 The CFC Media Lab “AR Dome” proved a popular destination, offering augmented reality (AR) demos from some of our IDEABOOST-Network Connect companies: Arfront Technologies Inc., whose AR product Sensei offers a peer-to-peer video platform; Battleverse, an entertainment and game development company featuring unique, action-packed experiences; House of VR, who shared “Prosthetic Reality”, an AR art show created by Australian artist, Sutu (Stu Campbell); Impossible Things’ 2016 Art Gallery of Ontario (AGO)-commissioned AR project, ReBlink, which digitally “re-mixed” select paintings from the AGO’s collection; LARGE (Location-based Augmented Reality Gaming Engine) by Albedo Informatics, which lets everyone create, share and experience rich AR content with just a mobile device; and LumièreVR, a cross-border team based in Silicon Valley, Canada and China working in VR who brought three distinct demos to BBQ attendees – Magic Leap, Vive and a VR Theatre. Overall, the afternoon was a huge success, with an unprecedented number of guests showing up to celebrate our past 30 years of shaping Canada’s entertainment landscape and toast to our future. This entire afternoon could not have occurred without our wonderful sponsors, volunteers and donors. For more information on our partners please refer to the "Event Sponsors" tab. We hope everyone enjoyed the afternoon!